As the City of Morgan Hill, California, renovates a series of lots in its downtown area it has created a temporary pop up park which can be moved from one vacant lot to the next as development progresses. 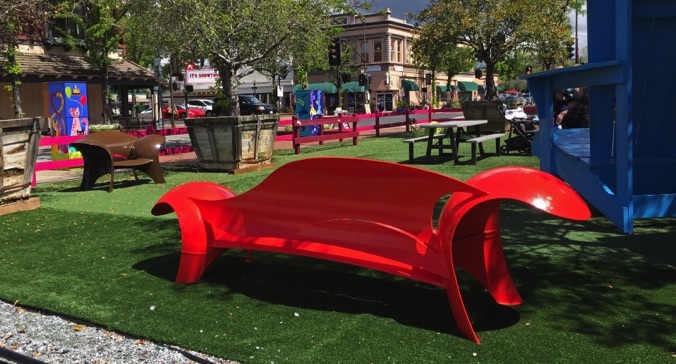 The City purchased a series of portable elements, including large trees, children's play blocks and a variety of colorful seating made by area artists. After a lease/trial period of a year The City purchased three of Colin's benches, including a red asymetric bench, brown club chair and yellow offset backless bench. Eventually the seats will be installed permanently in one of The City's public parks.